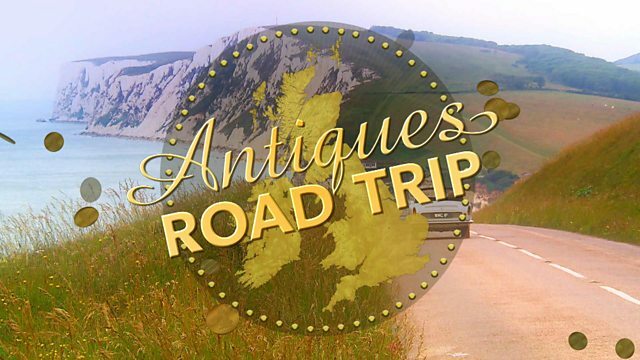 Antiques experts travel the UK searching for treasures. Mark Stacey and Catherine Southon begin in Aberdeen before travelling through Cullen and on to auction at Elgin in Moray. Browse content similar to Episode 24. Check below for episodes and series from the same categories and more! -It's the nation's favourite antiques experts. With £200 each, a classic car and a goal to scour Britain for antiques. -There'll be worthy winners and valiant losers. Oh! Come on, I got to get to another shop. where sunlight is a dim and distant memory. I don't know where we're going. -Do you think I've gone wrong? as both an auctioneer and a dealer. But he's found himself falling behind on this road trip. and seems to have found the key to success on this trip. But she isn't going to let the cat out of the bag. MECHANICAL SINGING How do you shut it up? which inspired a challenge to buy a canine-related item on each leg. I do believe I'm slightly ahead. You are way ahead, not slightly, Catherine. A chasm is opening up between them. giving her a delicious £290.42 to spend today. and is kicking off this leg with a rather limp £218.02. in their 1968 MG Midget. But he's ready for a fight. -When my back is up against the wall, Catherine, I come out fighting. I'm just coming to that. Our travelling antiquarians are cruising the length of Scotland. in the beautiful capital city of Edinburgh. across the north-east of Scotland to an auction in Elgin, in Moray. the oil industry in the North Sea. Oh, and there's a fine antiques centre here, too. Oh, here it is, Catherine. Right, you don't need to be so bossy! I'm not being bossy, I'm just pointing it out. You don't need to because I can see it - it says Antiques Centre. -I'm just trying to be helpful. Well, don't try too hard. Ah, the familiar squabbling of the lesser spotted antique experts. Let's hope they can behave themselves inside. as you know, but I think I'm going to leave you and go down that way. Go on, then. I'll stay up here. He's quite nice, isn't he? "The famous Chemould Art Gallery, Calcutta." Have you heard of the...? No, I haven't either. So they are not that famous, are they? and railway books from the estate of a railway enthusiast. Railway... So that one is trams, so we don't want that one. Actually, my little boy would probably really like this book. I'm going to go and get someone. and wants to share it with dealer Alex. because I'm sure I haven't and it's something so boring. -will come and buy these books. be of interest to the thousands who have a passion for the subject. This is from another dealer. -He's got them all priced individually. ..is take the lot for 30 quid. -I'll go and get in contact, then. Oh, he's lovely! Thank you, Alex. And it's not long before the lovely Alex comes back with some news. This one's about America, trains in America. Oh, hello! -Yeah, that will be fine for the books. Well, that's one purchase down for Catherine. How is Mark getting on? I really want to have a look at this little cherub painting in the gilt frame. so he's brought Holly in to get a closer look. I quite like this, actually, it's quite fun. It's got a little easel, which is rather nice. I think it' probably what we'd call decorated. It's had a print put on and then just painted over. With a ticket price of £40 it's one to consider. Now, Catherine wants to buy more here and she's dabbling in pens. The pen that I bought yesterday, sold yesterday, rather, was a Jones one. looking at the actual name. It wasn't a Waterman. But this is a Waterman so I would be going up in the world. And that's where I belong. But Alex is tempting Catherine with a Sheaffer fountain pen instead. -That's nice. Ah, that's lovely. synonymous with quality and value. what is Alex looking for on this particular item? -There is no movement on that. -OK. Would you do 45 on it? -That'll give you a chance. Thank you so much. Super. At half price, that seems a good deal, Catherine. That's two items down. Now, what's Mark up to? These are political cartoons from the 18th and 19th century. of political cartoons, mocking the government or even the royal family. They tried to ban them. They were not popular with the powers that be. This one is all to do with the Duke of Wellington. He's looking rather cross, with his hat and his big nose. You've got the Battle of Waterloo on the wall there. It's published in London in 1827.
and Napoleon, are very collectable and should gain a lot of interest. I tell you what also was quite interesting is the price. £25! I think that's a bit of a find, actually. It won't stop me trying to get it cheaper. and I want to come out victorious. to do battle over the price with poor Holly. Now, I really like these. -I would like to buy them and take to the auction. But I'm so far behind. but I'm not used to being behind, particularly with Catherine. But I would really love to pay £15 for this and 20 for this. OK, we could do this for 20 and this for 20, so that's 40 for the pair. -Holly, you've been very fair. Thank you so much. So that's half price on the frame and a fiver off the cartoon. and Mark is laying down the gauntlet. -I want a lot of money spent, Catherine. I want a lot of that money spent. Because I'm going to spend everything. I really am. I need to, Catherine. I need to find things. -You're going to spend every single penny? -I am, because I need to. with a ticket price of £25. Alex, can I borrow you for a second? -It is nicely drawn if you like that sort of thing. -I'm trying to convince you as well as me. -If I had a Westie I'd buy it. Can I have it for £10? I think 12.50 is the best we can do on it. That would be a 50% discount. 12.50. That's fine by me. in their first shop, but not even that can keep these two happy. -I'm always waiting for you. Come on, I've got to get to another shop. Oh, dear, it looks like the pressure is getting to them. Just as well they are splitting up for now. around the corner for a spot more shopping at Elizabeth Watt Antiques. and Jeff is on hand to help Mark spend his money. A rather interesting little brooch. It's Ola Gorie, from Orkney. -It's quite fun, isn't it? That is quite fun, actually. She was a pioneer in Celtic and Norse-designed jewellery. The only trouble is, not many people wear brooches these days. That's the real difficulty. I love the quality, I like the finish. -£12? We are so close. I was going to say ten. -Oh, I can't say no. £12. Come on. Thank you. -Promise? I think that's a bargain. £12? Not exactly the big buy we were expecting, Mark. the University of Aberdeen's King's College Chapel. by the Bishop of Aberdeen, William Elphinstone and King James IV. that serves as a constant reminder of the university's foundations. -Hello, Catherine. Welcome to King's Chapel. -about a medieval church interior. Automatic doors! That is surprising. -This is quite incredible, isn't it? Are all of these hand-carved? It's some of the finest surviving medieval woodwork in Scotland. Gosh, it's everywhere. Gosh, look at all these vines and thistles. they also tell the story of the university. To start off, we have the Thistle of Scotland, which is the king. -Yes, at the doorway as you come in, you see the king. which is the priesthood and the clergy and the Eucharist and Christ. between the king and the church together. Hence the name of the chapel, the crown on the roof and so on. Up here you can see two themes from the history of the university. which founds the university in 1495.
with ladders up against the church wall and so on. watching his university grow around him. That's a wonderful scene, isn't it? He was incredibly fond of this building. he chose to be buried in the chapel that he founded. And I'll show you what happens down here. This is the tomb that was eventually made for Bishop Elphinstone. leading up to his own altar. for such an important person to be buried in such a humble way. commissioned this amazing construction here. So what happened to the statue? hanging off it, so clearly something awful happened during the Civil War. who were notorious for plundering towns and cities. had been disturbed and the bones of the Bishop had been removed. -Thank you so much, Jane. -I've really enjoyed it. Thank you. and to get some shut-eye. It's been a busy day after all. Time to rest and to reflect on a good day's shopping. Nighty-night. Catherine has finally woken up to Mark's mind games. -Have you got much money left? -I know exactly what you're doing now. You want me to say, "Right, that's it, I'll spend it all." So it all goes horribly wrong for me. -Catherine, you've got to make your decisions. Uh-oh, looks like you've been rumbled, Stacey. I think you need to concentrate on what YOU'RE buying from now on. depicting Wellington and a vintage Scottish silver brooch. That means he has £166.02 left in his coffers. which still leaves her with a magnificent £202.92 to play with. to the rural idyll of Glass. but it looks likes he's leading her up the garden path. -Do you think this is it? -Well, the sign pointed this way. of affordable antiques and collectables. We'll catch up with Mark shortly. -I didn't know if I was going to get in! Hi. I'm Catherine. -Hello, Tim. Nice to meet you. Inside, Tim and Lynn are only too keen to help. but Catherine already has her dog purchase sorted. So she's turned her attention to something shiny priced at £60. No weight to them at all. Peacock feathers opening out. What do you want for it? Normally it would be about 50. -Of course. The woman is always the boss! Can you do that, yeah? Does that still give you a bit of a margin? -A wee bit?, Well, that's good. OK, £20. Cor! You're on fire today, Catherine. Another nice purchase at a snip. to the oldest distillery in the Highlands of Scotland. making the distillery arguably one of the most beautiful in Scotland. -Hi, Mark. Ian. Welcome to Strathisla. -I'm dying for my tour. Whisky is as synonymous with Scotland as tartan and bagpipes. similar to aqua vitae, the water of life. Over time, the shorter "uisce" was anglicised to whisky. King James IV enjoyed "ardent spirits,"
and paid to have whisky provided at his pleasure. involved in the production of whisky. There are things here like Sikes Hydrometers. -and that would tell you how much alcohol was in it. It's been a long evolution to where we are today. -Years ago it was gunpowder. A measured amount of gunpowder and a measured amount of spirit. If you lit it and it burnt blue, you were under proof. If it burnt orange, you were pretty good. -If you lost your eyebrows, it was a wee bit high. -It was over. What's this? -It's called a gauging rod. In the warehouse you would take the bung out and drop it into the cask. -Every year we lose 2% evaporation as the whisky matures. This gauges how much has been lost through evaporation in the cask. This was made in London. "Customs & Excise". They get everywhere! by law there had to be a customs officer living in every distillery. Yeah, the taxman and whisky go way back. and full-time excise men to collect on Scotch whisky. and often in cahoots with local communities and judges. produced high-quality whisky legally from the late 1700s. The basic whiskey-making process is the same, but technology has moved on. Ian, the first thing I notice in here, it's very, very noisy. water running through the condensers at the back. -So that's a lot of background noise. -It is, isn't it? I love this. It's so visual. This is the modern hydrometer. This is the way it is, yeah. This is exactly what every distillery in Scotland is doing. where the evaporation creates a purer alcohol. The right-hand side is your first distillation. and then you have the liquid in the hydrometers. although some are distilled up to 20 times. Scotch whisky regulations require anything bearing the label "Scotch"
and matured for a minimum of three years in oak casks. I mean, this is really fascinating. I love it. I'm delighted you enjoyed your visit. You've seen everything apart from one thing - the whisky. -Let's go and taste some whisky. -Oh, but I'm driving, Ian! -Let me find you something to take away, then. Looks like you'll have to wait until later to taste yours, Mark. -Go home and try it. I look forward to that. Nice to meet you. Oh, you lucky devil! Now, remember to keep some for me, Mark. to the coastal town of Cullen. and for the highly impressive viaduct that soars above the town. So far, Catherine has spent over £100. he has only spent half that. -I'm going in there. I'll see you later. while Catherine is trying Abra Antiques for size. -Hello, there. Hi, I'm Catherine. -Hi, Tom. Good to meet you. There are a lot of quirky and eclectic pieces in here. Has owner Tom got any suggestions? Now, I have the most perfect thing. Aha! A late 19th-century Indian silver purse, priced at £86. You're bound to like this. Sorry. Oh, I love that. You're not sorry at all! -I'll take that out, give you the box. Right, let's have a look at this. What have we got? -We've got this lady in the centre. -A dancing girl, I think. She looks like she's dancing. And little elephants around the side. -It is silver, but it's not sterling. -What's the best you can do on that? What about a little pinch at 65? Go on. Would you like to shake at 65? but Mark is having some dog problems. Catherine is going to hate me - I can't find a dog. I can't find a dog that really bites me. But I love this pig. I LOVE this pig. So I'm going to have a piggy poochy purchase, I think. I don't see this going down at all well, you swine! I mean, look at that face. Don't you die for that face? the farmer's had his name and the date put on. a little bit of folk art from the 20th century. He is kitsch. I think it's silver. I just think it's unmarked. I think it's great. What it isn't is a dog. best bring in dealer Alan. I've failed in my poochy purchase. I was supposed to find a dog. But I have fallen in love with your pig. -I'd love to get him for £30. You can't go to 35? -Just to give me a chance? -To give you a chance? -I'd love to buy him, honestly, for 35. -OK, then - we have a deal. Oh, thanks, Alan. Catherine is going to hate me, but I love him. You've made my day, Alan. to see if Tom has one last bargain for him to take to auction. but that's Jade, Art Deco. -No, no - I will do a good buy on that. -Well, how good a buy? to give you a chance of winning, 50 quid. -Oh, Tom, are you sure you can't do it for 40? -Tom, you are a meanie! -No, I'm not a meanie. I'm giving it away. What's a fiver between friends? It makes a big difference - between death and life! -So if I don't pay 45, you can't eat tonight? Yeah, let the man eat, for heaven's sake. when our experts reveal all to each other. -You seem to have got a lot of stuff - let's have a look. -I don't know what to say. Yes. And this one is gorgeous. -I didn't like it, no. -OK, it's not Victorian, but it's got a little bit of age to it. I like the little Marie Antoinette. -I only paid 20 quid for it. Well, there we are, then. Hm, Mark's a right moaning Minnie today, isn't he? -You should be ashamed of yourself. you could have done so well! -Do you want to see mine? OK. Oh, yeah, that I saw that in the shop. -I'm happy you rejected it. -How much did you pay for that, then? -Yes, they saw you coming. -I don't think they did, actually, Catherine. Yes, hold on! That's not on! Look at that. Briggsie, 1920, unmarked silver. -It's very nice, Mark, but that is against the rules. I couldn't find a dog. There are no rules, Catherine. There's no rules. -It's as light as a feather. -Yes, but it's quirky. Pigs are popular. Let's hope this is the end of all this dog challenge nonsense. Oh, you'll love this - I've got to show it to you. Have a guess how much. -I don't know - 30 quid or something. But has it or has it not again been fun? I think we'll agree to disagree on this one. Get your hands off! After all that barney, what have they got to say for themselves? Wasn't he horrid? I didn't think that was very nice at all. which I thought was a bit of a cutting remark. about some of the pieces she's bought, but I'm not, I'm sorry. and head to the auction - smartish. and Moray, starting in Aberdeen and ending in Elgin for the auction. en route to obtaining the crown for himself. a UK-wide reputation thanks to its internet bidding. -Are we going through the back entrance? -I think we go into the cattle shed. what he thinks of our experts' items. Well, I think the Briggsie pig will sell well. of Scotland, so just for a quirky item, I think it should do well. going through, but probably usually later models. That is an earlier sort of model. and splashed out £132 of that on his five lots. Not exactly the entire budget. and parted with £172.50 on her five lots. I can't tell what he's saying! I think he's praying for rain. Let's hope the bidders don't rain on your parade, Mark. First up is your porcelain plaque in an easel frame. 20, then. 5. 10. 15? 15 bid, 20? 5, 30. 45 bid - all finished. He may be fast, but he can't half get the bidders interested. It's Catherine's railway books next. Let's hope someone here finds them less boring than she does. 5 and 10, 15, 20, 5, 30. -Oh, come on - a bit more. -The lady's bid at 35. Come on, a bit more. £40, £40 it goes, then. Done. You're on the right track there, Catherine. Not a bad start, girl. Mark's Ola Gorie brooch is next. -10 for a bad start. -Ooh, I'd love £100 for it. -Come on, a bit more. -Lady's bid in the room at £55. -55 now, ladies and gentlemen. 55 to be sold in the room, then. 55, the internet is flashing at me here. GAVEL BANGS 55, that's very good. It looks like the people of Elgin share your taste. -Thank you. That was said with such sincerity! opens like a peacock's tail feathers? Somebody buy it - 20, 10 bid. -I was surprised with this. -Well, you've doubled your money. To be sold again, ladies and gentlemen. profit, Mark! Well done. This is going well. Can Mark keep up the good form with his jade Art Deco mirror? The one that Catherine rejected. -So if this flies, I'm going to be kicking myself. -Ladies and gentleman, 25 I'm bid. 10. Oh, this is where it's all going to go wrong. -It's all going wrong now, Catherine. -35 for the second time. So I did the right thing to reject it. but Mark is still in the lead. Yes, I knew it was the right thing to do, to reject that. can she catch up with this leg's offering? The Sheaffer pen, complete with box. £20. Start at 20, 10, 5. -Sure an opening bid. Five pounds bid. Come on, we've got a long way to go here. Original case I'm told at 40. -Will be sold again at £40, away, £40. Oh, small loss there, Catherine. and win the, um...dog challenge? 10 bid, £10 bid for Briggsie. 15. -Oh, it must be more than that, surely? Well, I'm surprised at that, Catherine. Ouch, that comes back to bite you, Mark. That's what you get when you don't play the game, eh? That was a bit of a pig in a poke, wasn't it? win this leg's dog challenge? -A Scottish terrier, two bid. -I think that's what it's worth, actually. -Oh, I can't believe it. -Not cheap enough, as far as I'm concerned. -I think the sellers are disappointed! -You've got the luck of the Irish! and more importantly, has closed the gap on Mark. So, how will Mark's final item fare? The hand-coloured political cartoon depicting Wellington. This should make more than that. I think you're all done here. £80 bid. but I'm pretty happy with it. And so you should be - it's a fantastic profit for Mark. He'll never sa-tire of hearing that. the Indian silver purse, do the trick this time? £20 bid. 20 bid, 40. -Late 19th century, Indian. £40 bid. 45. -Come on, I need you to get a bit more. -55, 60 still with me. 65 bid, fresh blood at 65. 65 and I look for more here, 70. Are you all done, ladies and gentlemen? 75. 80. £80 bid, are you done? £80 to be sold, then. -He had a commission bid on that. but it's been a good auction for both our experts. He's this leg's winner, leaving him with £291.02 to take forward. Did Catherine let Mark's mind games get to her? and only improved her margin by a mere £16.10 after auction costs. She takes a slender lead into the next leg with £306.52. Catherine... Oh, it's getting close! -I'm back in the game! You were trailing so far behind. -This is going to be very, very nail-biting. So, it's all to play for as we head into the final leg. How exciting. Mark thinks he's judging the Great Road Trip Bake-Off. -I'm going to put on weight and have that lovely scone. Whilst Catherine is having a whale of a time. Looks like he's had a few! His eyes are going all funny! Antiques experts travel the UK searching for treasures. On this leg Mark Stacey and Catherine Southon begin in Aberdeen before travelling through the coastal town of Cullen and on to auction at Elgin in Moray.